Hungary is the birthplace of Age of Nemesis (originally just called "Nemesis"). With their latest release (actually a reissue) on Magna Carta Records, they are being given a lot of media attention and creating quite a buzz. They are being called things like "the new Dream Theater." I had the chance to bounce some questions off of Age of Nemesis guitarist and spokesperson Zoltan Fabian (yes, that's his name and not the name of a character in a Harlequin Romance novel ... OK, it might be both, but I don't know). In any event, Fabian had much to say about the history of the band, the future, the Hungarian music scene and more. Some of the questions were provided by Dan Hanley from Magna Carta. Wormwood Chronicles: For those not familiar with the band, could you give us a bit of a rundown on the history? This is sort of a second coming of the group, right? Wormwood Chronicles: I know artists hate to have their art described or pigeonholed, but how would you describe it? ZF: Yeah, that's not easy! People say it's progressive metal. When we write songs which are influenced by our actual moods. We usually use metal themes, heavy riffs, dark atmospheres and sometimes slow and sad parts. I like to "travel" between music genres that I know or can play. I don't like musical borders at all. Of course, we're trying to find our own way in music, and we're working very hard at it. It's very difficult cause there are so many bands, so many good bands in this genre which is known as progressive metal. Personally, I don't want to live forever in the shadow of Dream Theater or the other great bands. Fortunately, there is development in our music from album to album but we want to be a band with our "own" style. As the main songwriter of the band, I've got ideas already about what I want to work out. But until that time comes when you'll be able to listen to it, I only say: we're playing melodic power metal with progressive elements. Wormwood Chronicles: How is the Hungarian progressive music scene? ZF: There was a time when there were many progressive bands in Hungary but most of them changed genre or gave up all together. Most Hungarian musicians have to work a regular job if they want to pay the bills. This is a small country and progressive music is an underground genre here (too). Of course there are a few Hungarian bands that have had success abroad in the past: bands like After Crying, Stonehenge and Solaris. The media doesn't help this genre at all, so if you want to achieve anything, you have to do it by yourself. There's no appreciation for real individual music and thoughts... It's all about money. If they can see some profit in your music, then they will "help" you, and you can "play" by their rules...I guess this problem exists everywhere, not only here. They say there's no demand for this music, but I say: if people don't know anything about this kind of music, or other "kept in secret" genres, how can they decide whether they like it or not? At the same time, I know many young local bands that formed in this genre, and they could become very good, if they don't give up. I'm happy cause we manage to stay alive in spite of these difficulties. Wormwood Chronicles: Is Psychogeist based on an actual occurrence, or book? If so, let me have some details on it. ZF: No, no, Psychogeist isn't based on an actual occurrence, but who knows? Maybe it could happen�I read many writings about the "strange toys" of armies and governments. To tell you the truth, I was influenced by a novel of Dean R. Koontz when I wrote this story and these songs. It's 600 pages long, so it was difficult to put all my ideas and moods into these 6 songs. I also changed the story and the characters slightly because of this. Those who know Koontz's novels will know which one this is, but I won't tell you, cause I'd like to "help" raise his sales in this way...ha-ha ! Wormwood Chronicles: What are your musical influences, both personally and as a band? ZF: We all were born in or around 1970, so we could listen to the best bands in all genres, I think. In our childhood we listened Beatles and some Hungarian rock bands... or sometimes Boney M. (ha-ha) When I was teenager I was a big Iron Maiden fan, and I actually started to play guitar because of them. I think everyone in the Age Of Nemesis was influenced by them. We liked all heavy metal bands of the "golden age." Then we started to explore other styles such as hard rock, AOR, or progressive rock. Huge favorites include: Queen, Whitesnake, Deep Purple, Styx, Journey, Toto, Kansas, Yes, Marillion, and Rush. Then I listened to Queensryche. I think I can mention them as my/our great influence. In 1989, I bought the 1st Dream Theater album and it totally blew me away. If you'd ask the Dream Theater guys about their influences there would be some parallelism...isn't it strange? Personally, our main influences are: Ian Gillan, Bruce Dickinson, Geoff Tate, Glenn Hughes, Steve Morse, Gary Moore, Al Dimeola, Joe Satriani, Frank Gambale, Steve Lukather, Neal Schon, Steve Vai, Allan Holdsworth, Steve Harris, Geddy Lee, Randy Coven, John Myung, Billy Sheehan, Dean Castronovo, Steve Smith, Simon Philips, Gregg Bisonette, Omar Hakim, Akira Jimbo, and many more. As a band, shortly and simply, we started to write songs without any concept. We simply switched on our "sensors" and played what we liked and could play. We like bands that have their own thoughts and feelings: those that can touch our souls and we'd like to touch many souls as well! Wormwood Chronicles: Where did the various members of the group come from - any other musical projects we might be familiar with? ZF: I've been playing together with Gyorgy Nagy (keys) since 1989. This is our 3rd common band. Our singer, Zoltan Kiss ("kiss" means "little" in Hungarian) came from a symphonic metal band called "Classica." Our present bass player, Gabor Krecsmarik, also came from this band, but a little bit later. 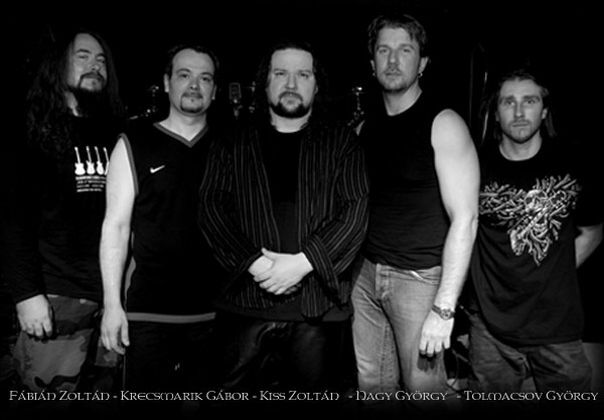 Our previous bassist Csaba Berczelly, who played on the Psychogeist album, played with Gyorgy and me for long years. Drummer, Laszlo Nagy came from a folk rock band called "Kormoran" but he's playing in 4 bands simultaneously in different styles. He's a universal drummer. Wormwood Chronicles: What musical training have each of the band members had? ZF: Keyboard player Gyorgy Nagy can also play the trumpet. Drummer Laszlo Nagy also plays guitar and zither. Bassist Gabor Krecsmarik (who replaced Csaba Berczelly) can play on drums and guitars very well, and also has a good singing voice. Singer Zoltan Kiss plays guitars. I can play the bass guitar and keys, a bit. But we haven't had any serious musical training... Who would have thought? Apart from myself, everyone in the band learned to play their instruments from private music teachers. The most important thing is continuous practicing and continuous self-training. I learned everything by myself and my teachers were (and are) the best guitarists in the world. Wormwood Chronicles: Are there musicians out there with whom you would like to work in the future? ZF: We also have an instrumental project called "The Goddess Nemesis Project." When we started work on it we thought about guest musicians, and our manager started to search for them. In the end, eight very good guest musicians played on the album. There were musicians who didn't play with us because they couldn't find time: for example, Jeff Kollman. I like his playing style very much, so I'll ask him again when we make the next album of this project. We invited Jordan Rudess as well, and also Tomas Bodin from The Flower Kings. But they couldn't make it either. Of course, we'd like to work together with every one of our main influences...that's every musician's dream. Time will tell! Wormwood Chronicles: Do you think that downloading of music is a help or hindrance to the careers of musicians? It's been said by the major labels that it's essentially the heart of all the problems they are having in terms of lower sales - would you agree? ZF: Until there are only short samples of the albums upped for the audience to help their decision about whether to buy or not, downloading is useful for everyone. Beyond that, everything is simply robbery, I think. Bands and musicians spend their money on expensive instruments, they work for long years before they can make an album, engineers put their hearts and souls into the sound of the albums with expensive studio equipment, labels work hard on marketing, distribution etc.and in the end, everyone will be able to download everything and put 15 albums on only one CD-R in a lower than low quality. I think that's robbery. As you can see, my answer is: I agree! Wormwood Chronicles: What's ahead for Age of Nemesis? Touring, more recording? ZF: We'd like to play gigs at home and outside of Hungary as well. I'm working on that at the moment. We're also writing our new album and we want to mix our instrumental album again this spring coz we're not satisfied with the sound of the latest version. Our last record was a concept album called Terra Incognita. The next album will be a "simple" album on which I'll try to use my new musical ideas for making our music more individual. Wormwood Chronicles: Where did the name for the band come from? ZF: Nemesis was our 1st singer's idea. We had many name ideas but we finally chose this one. I think the name of the band is important, but only the music can fill it with real meaning. We used this name till last summer, but I found 13 bands with the same name on the web. Also, we had some problems with the Hungarian copyright agency and we could solve our problems by changing our band's name. Peter Morticelli at Magna Carta also suggested this, so we came up with our new name: Age of Nemesis. It contains the old one as well and, unfortunately, it might be true for this age that we're living in now, here, on Earth. Wormwood Chronicles: What was the last CD you bought, or what have you been listening to lately? ZF: Hmm, let me see. The last one what I bought was Cosmosquad's Live at the Baked Potato album. This is really amazing stuff. Lately I've been listening to Unicorn Jones' A Hundred Thousand Million Stars album. Wormwood Chronicles: What about the last concert you attended for your enjoyment? ZF: It was a Pain Of Salvation gig in Budapest. I like their music and their thoughts about the world very much but I've never seen them live yet. They were fantastic live, and the audience was great too cause it was a 'full house' gig...the fans showed clearly that there is still a big claim to this genre and music. That always makes me happy! Wormwood Chronicles: What has been your biggest Spinal Tap moment? ZF: Life can be a long Spinal Tap. I think my biggest spinal tap was the moment of my birth! But sorry, I can't remember that well! Wormwood Chronicles: Finally, are there any closing thoughts you'd like to get out there? ZF: I hope we'll be able to meet everyone that likes our music live as well. Psychogeist's songs are old ones for us, so we can play them live much better now. My best regards to every human (and non-human) being that likes and understands real music. Thank you very much for the interview and thanks to everyone for reading it.